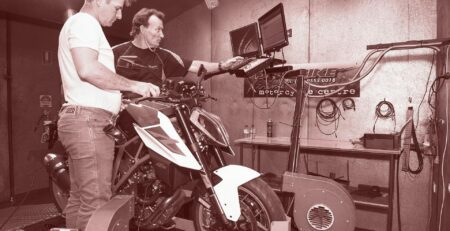 Now that we know how important the Dyno is in checking a bike’s all round health (assuming, that is, that you’ve read the previous article), let’s take a look at reading the information it provides and dissect the important stuff from the not so important stuff. The graph directly below (Example .1.) is a typical power curve. In this example if you look to the bottom middle it says rpm, we could change that to speed, time or other. Each number represents 1000 rpm and so on. Up the left side the numbers represent horse power – in this example starting at zero and going up to 125 hp. Again we can change this, if you like, to kilowatts, torque, speed, air/fuel etc. We might change this, if for example, we wanted to look at air fuel ration across the rev range at say 20% throttle or, if the customer was complaining about a flat spot at 3000rpm, we might change both to show air/fuel on the left and torque across the bottom, more on that later. If you follow your eye from the left across the bottom to the 8000rpm mark and draw an imaginary line straight up to where the power line is – we can see that at this point in the rpm range the measured horse power on the left hand side is just over 50hp. Follow the blue line further to where it peaks, just before it falls over and drops down again. That’s the peak or maximum horse power of about 100 hp. That one point at 14000rpm is what everyone wants to know about and compare. Also consider that this example is at 100% throttle. Now who rides their bike at 100% throttle all day long?…….well no-one, not even racers. Data log one lap around a race track, I can tell you the throttle is at 100% for less than 20% of the total time – at some race tracks it might not even be that high. So how important is the figure now? This next graph (Example 2) of the same bike is showing power and torque, again drawing an imaginary line straight up from 8000rpm we can now see this bike has 52 hp and 34 ft-lbs of torque. Also note that peak torque is lower down the rev range than horse power. 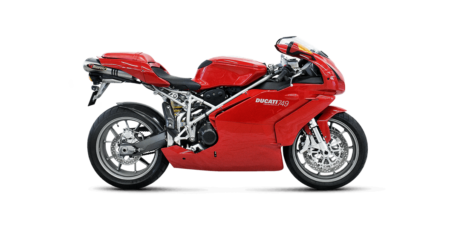 All in all these three examples are quite normal, the bike is running well, that is at 100% throttle anyway, confirmed by three things, power torque and air/fuel ratio. But what happens to the graphs when things are not so good. Now we know how to read the basics, let’s take a look at some problem bikes and figure out what’s wrong. The following graph is from a bike with chain and sprocket wear. A sure sign of drive line wear is when the customer complains of having trouble changing gears. See how much smoother the red line is with new chain and sprockets. This bike also feels much smoother and quieter on the road with new chain and sprockets, will use less fuel, and won’t have wheel bearing, swing arm bearing or gearbox bearing problems later on as a result. This next one has a spike in the top end of the rev range, that’s a misfire and can also be felt riding the bike on the dyno. I’ve included an air/fuel graph on this one because incorrect air/fuel can cause this problem. (Refer to example 3 above on how to read it). Though we can’t rule out a fuel issue as the cause in this example, in most cases when we see a spike like this it’s more likely to be an electrical misfire. We’ll come back to this one next week and show you how it all went. Because the entire air/fuel map is in a bit of mess anyway, it needs to be tuned properly first. This bike below is suffering from fuel starvation as seen here by the fuel curve in light blue, if you read the numbers to the right it’s almost climbed off the chart (lean) and it matches the power curve in this area as you can see it’s dropping off at about 10,000rpm. 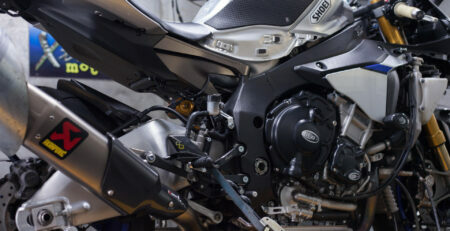 Normally this bike, a GSXR750, would be showing a peak of about 120hp. With this information it’s obvious we have a fuel problem, often people make the mistake of thinking it requires a Power Commander, Bazzaz, or other device to richen up the mixtures. Next week we’ll find out what the problem is. Clutch slip can sometimes be hard to feel on the road, however on the dyno there’s no place to hide. We are looking at the torque, read from the numbers on the right (bottom line), see how it has a big spike at the top end and the power curve (above it) is unstable in this area. That is caused by clutch slip in most cases. Sometimes all that’s required is a correction in adjustment of the clutch cable, however left unchecked and in a short space of time this bike will be pulling lots of revs and not really going anywhere. 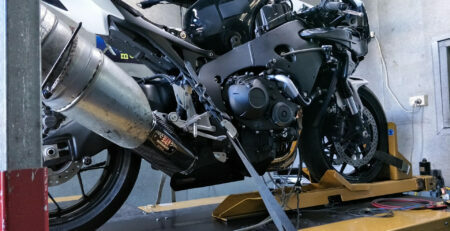 This model should have 100hp, we know this because we’ve dyno tuned a lot of them. So why does one have less the 80hp? The first couple of dyno tests filled the room with blue smoke because it was burning oil. I actually had to take a step back and think about this one. But why? – there wasn’t that many kilometres on it! We checked the oil level to reveal it had been over filled with engine oil, roughly 2 litres too much. Once the oil level was adjusted it stopped burning oil and produced a lot more power. Come back and visit next week, we’ll show you what we found with some of the above problems and what was required to solve those problems.